Vasa vasorum are a well-known and well-described entity. The definition of vasa vasorum is a vessel inside a wall of a larger vessel. 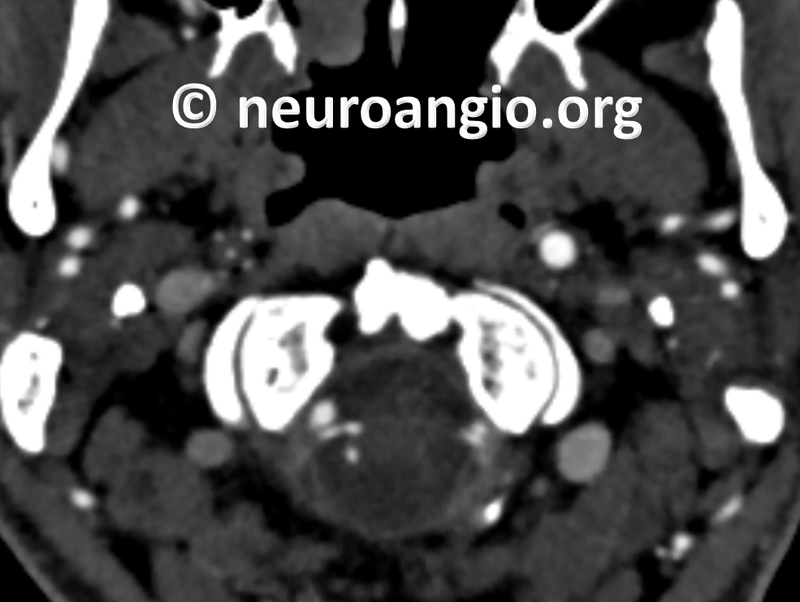 Only relatively large vessels such as the carotid artery, have vasa vasorum. Smaller caliber vessels do not need them — smaller is relative though — for example M2 vessels have plenty of vasa vasorum. 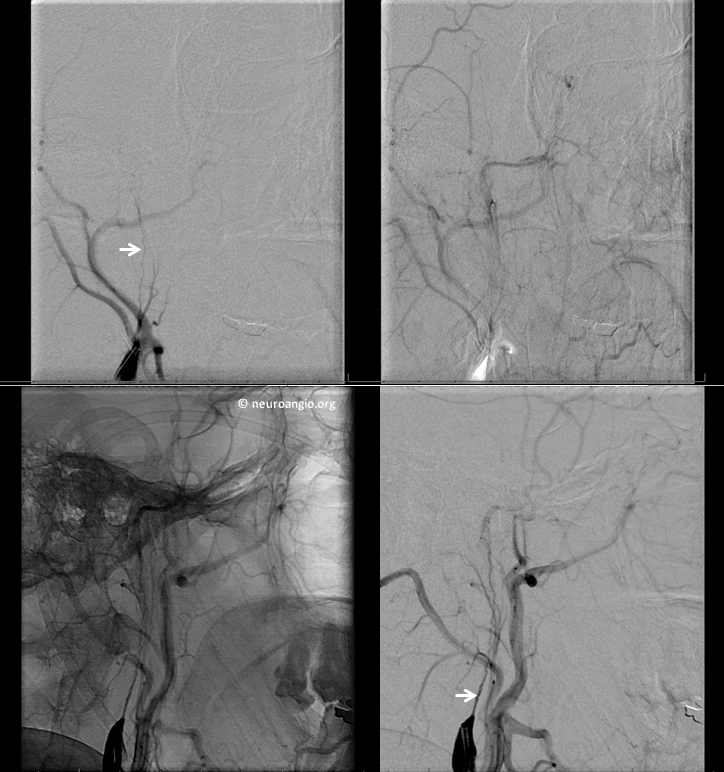 Normal vasa vasorum are far below angiographic resolution. 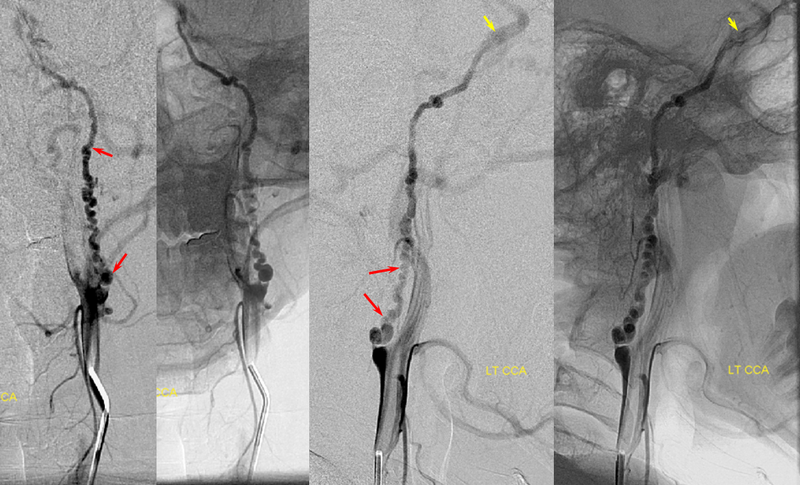 However, when the vessel containing the vasa vasorum is occluded, these small vessels can, with time, undergo sufficient hypertrophy to provide a fascinating collateral channel bridging the occluded segment to reconstitute the distal portion of the vessel, thus acting as a collateral in the very wall of an occluded artery. When resident or fellow trainees encounter presence of vasa vasorum angiographically, many do not make the appropriate diagnosis. The discussion instead goes towards a “string sign”. While vasa vasorum might look like a string sign, the implications are very different. A “string sign” refers to critical stenosis of a vessel, with a tiny residual native lumen. This implies that patency of the native lumen can be restored, either by surgical or endovascular means. 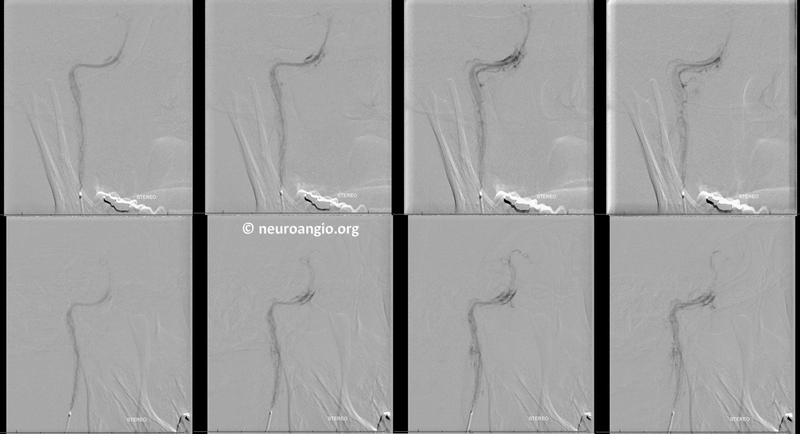 A string-like vasa vasorum is an entirely different entity — it is a collateral channel within the wall of a completely occluded vessel, reconstituting the distal aspect of the native artery beyond its occlusion. Since vasa vasorum are normally microscopic, their angiographically detectable presence implies sufficient time lapse to allow for their adaptive hypertrophy, thus attesting to the chronic nature of native lumen occlusion. Of course, they are by no means to be subjected to any kind of revascularization maneuver, such as stenting. How to recognise vasa vasorum? Easy — look at the pictures below. They all look similar — a long, tortuous, corkscrew-like vessel which is just to the side of where you might expect to find the native lumen. The typical location is the ICA. Here is another, really nice case, courtesy of Dr. Eytan Raz, which shows the timeline of vasa vasorum formation. 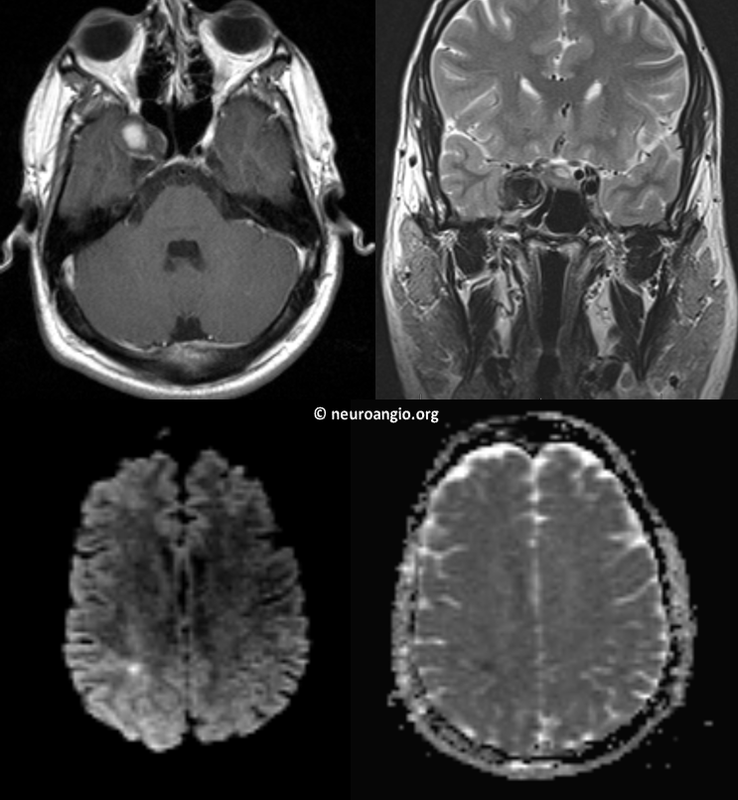 This patient presents with guess what? A small stroke in the right posterior centrum semiovale. The eyes are fine. There is a giant right cavernous aneurysm. Nice ACOM reconstitution, with a fenestration. 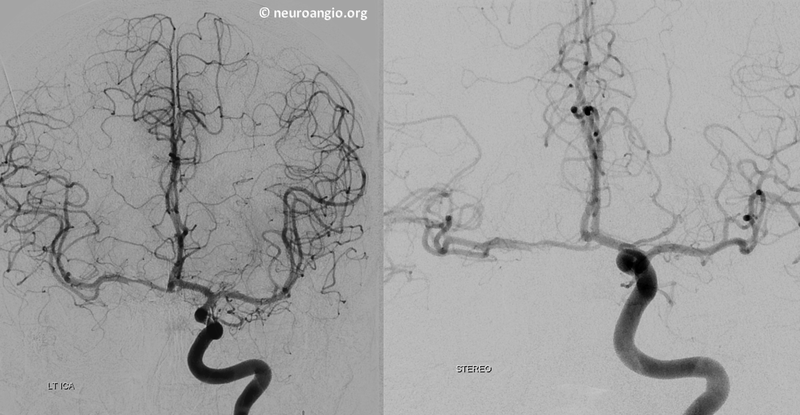 So, do we need to do an angio if the aneurysm has shrunk? Maybe yes, maybe no. We think yes. Here it is — guess what? A vasa vasorum channel has formed (white arrows). Could the aneurysm be recanalizing? Now, look at these gorgeous microcatheter injections at the mouth of vasa vasorum channel (white arrows). 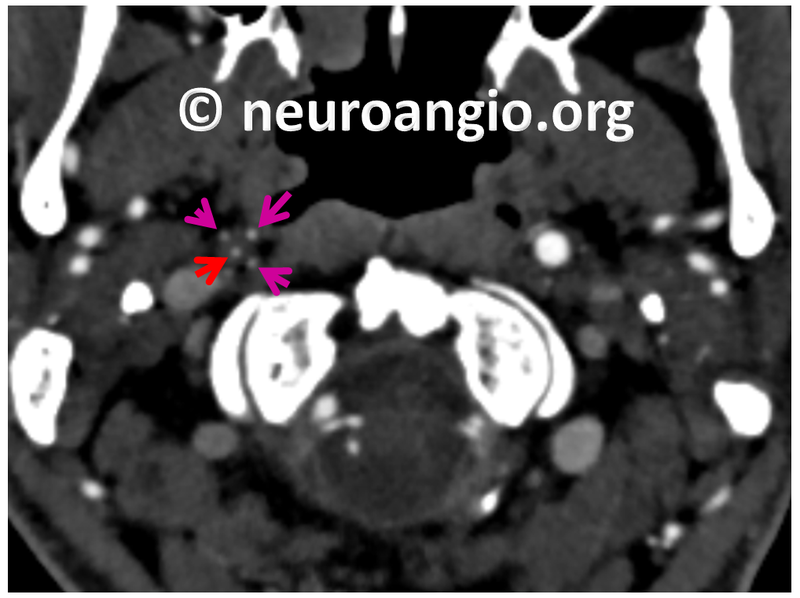 The carotid artery wall itself shows parenchymal blush (black arrows). We’ve never seen it so clearly before. 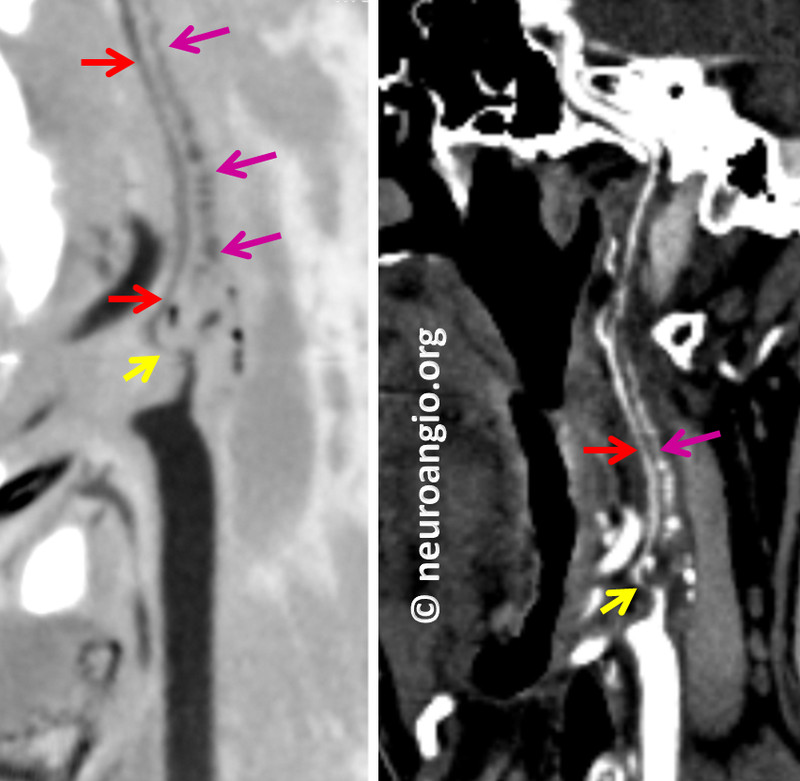 Venous phase shows a small regional vein (purple) draining the carotid artery wall. 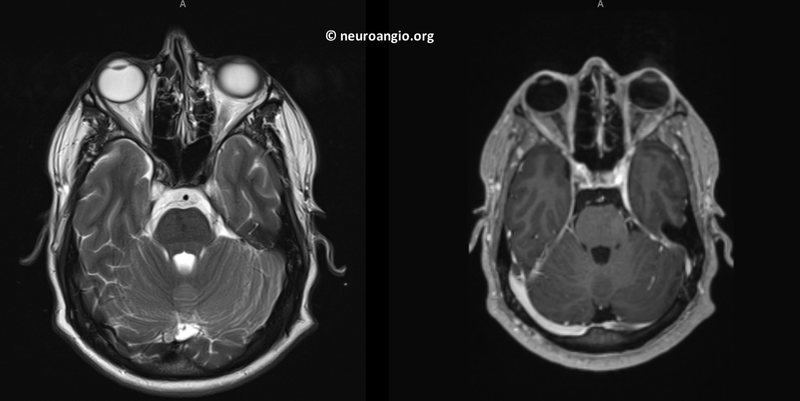 A slightly different projection, frontal views on top, lateral ones on the bottom. More draining veins are seen in the venous phase. 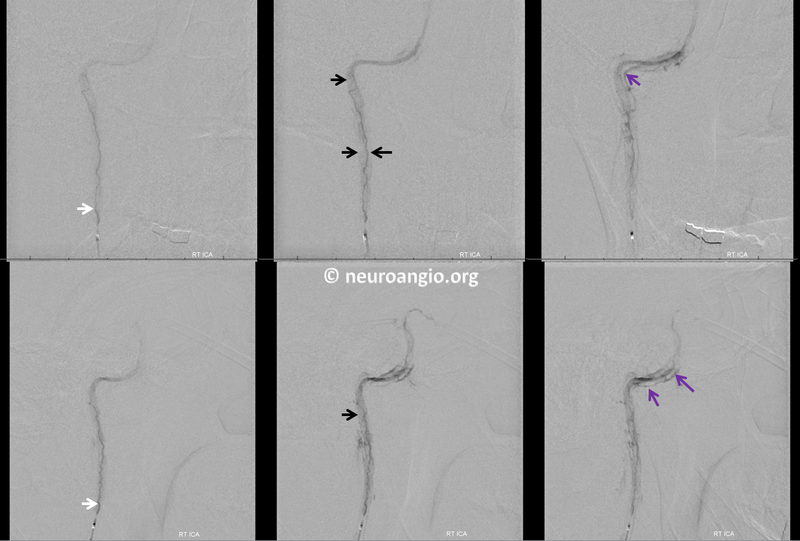 Should we close the vasa vasorum channel which is trying to recanalize the aneurysm? We chose to re-image. 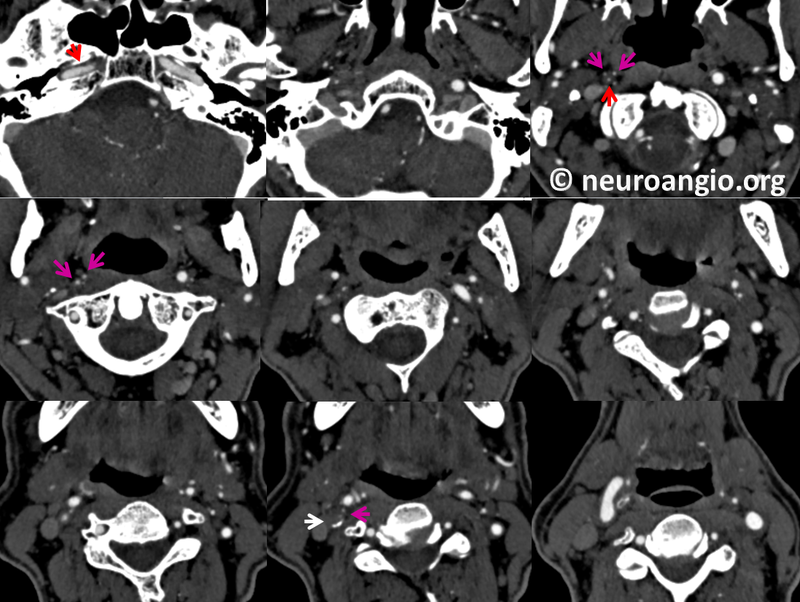 A single imaging highlighting multiplicity of vasa vasorum in the wall of the distal cervical ICA (pink). The surrounding fat helps outline the right ICA. One of the vasa vasorum channels has reconstituted the true lumen (red) more proximally. 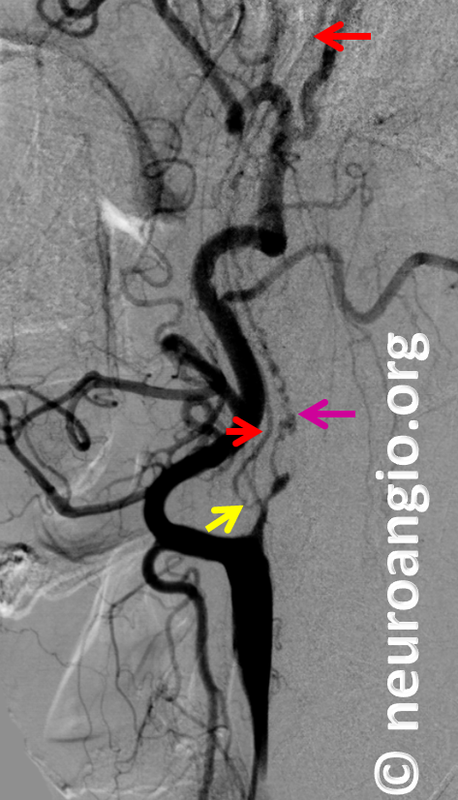 Curved reconstructions showing both the tortuous, long vasa vasorum channel within the arterial wall along the length of the cervical ICA (pink) and the true lumen (red) reconstituted by a short proximal vasa vasorum channel (yellow). It is important to understand that, despite presence of the true lumen, the bridging vessel between the proximal ICA stump and the true lumen distally is not native lumen but vasa vasorum (yellow) — notice its sharp angulation and connection to the vasa vasorum channel highlighted by the pink arrows. 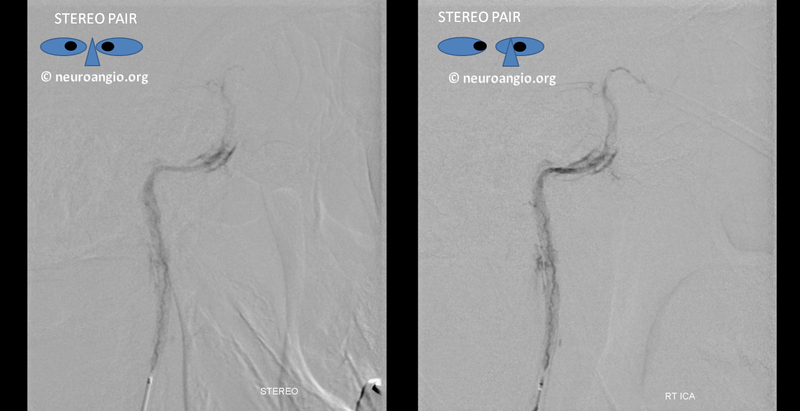 Digital subtraction angiogram shows the same morphology. 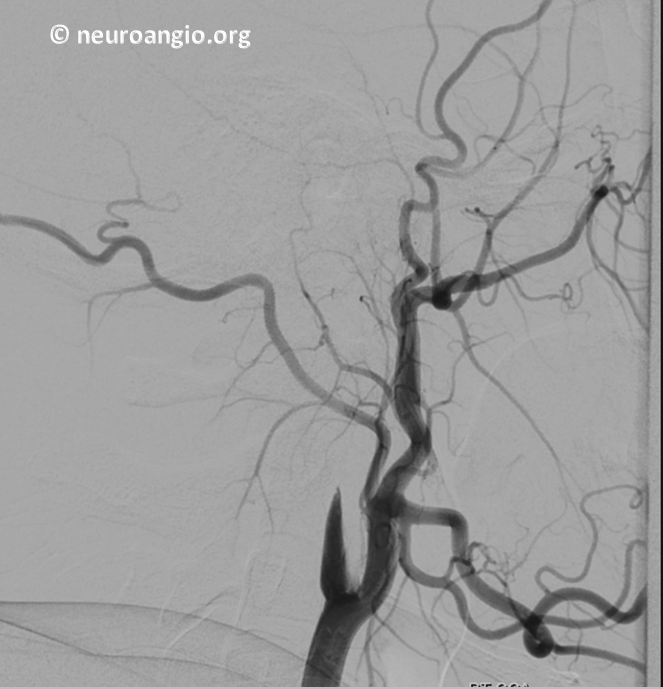 The high quality of this CTA makes diagnosis possible without the angiogram however.